Since many of this week’s Country Radio Seminar attendees reside outside Tennessee, they received an experience that is essentially Nashville last night (Feb. 27)–attending the Grand Ole Opry. However, instead of taking everyone to the Opry House, they brought the Grand Ole Opry to the attendees at the Nashville Convention Center. Ashley Monroe injected some old-school country into the evening with her airy, lilting voice on “Like A Rose,” the title track of her upcoming album, with backing guitar and vocal work from Gill. Following Monroe were performances from Scotty McCreery, then Nashville‘s Clare Bowen and Sam Palladio, who were received enthusiastically by the radio crowd. After a video clip of Darius Rucker‘s induction into the Grand Ole Opry last year, Rucker performed two of his signature tunes, “Alright” and “Don’t Think I Don’t Think About It” before lending his booming voice to a cover of Old Crow Medicine Show’s “Wagon Wheel” (also Rucker’s latest single). The show hit a minor snag when host Gill mispronounced Kacey Musgraves’ name upon introducing her. The misstep became a running joke throughout the rest of the evening. Musgraves, who has a surging hit on the MusicRow CountryBreakout chart with “Merry Go Round,” charmed the crowd with her candor on “Step Off” and her aforementioned debut single. 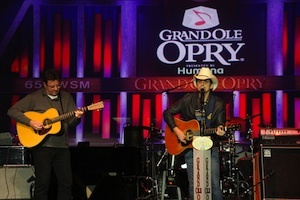 The evening closed with an acoustic performance from Brad Paisley, who was inducted in 2001. He sang “This Is Country Music,” followed by “Southern Comfort Zone.” After joining in on the fun with a wisecrack about Gill’s age, Gill reminded him that many artists have had their names mispronounced during their debut performance including Martina McBride and Gill himself. “Thank you, Vern,” Paisley replied. 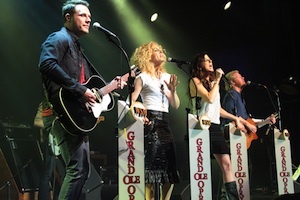 The friends and fellow Opry members closed the show with “Mud On The Tires,” with Gill on background vocals and guitar.